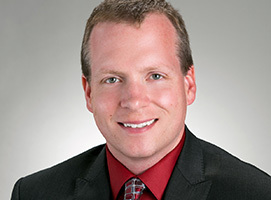 Ruffalo Noel Levitz recently commissioned a major research project to better understand advancement leader priorities, challenges, and strategies. 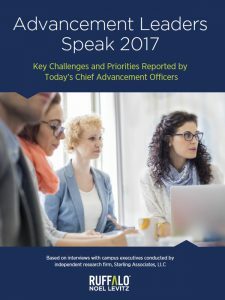 Through 40 in-depth interviews with higher education leaders across the country, we uncovered what chief advancement officersare really thinking about the future. The interviewees were chief advancement officers and leaders with a 360 degree view of their organizations, including budgets, performance metrics, and where the resources are going. More than just a survey, these interviews got to the heart of the top priorities. We listened to the leaders talk and captured a wealth of powerful quotes and insights. 90 percent of advancement leaders say booking big dollars is their number-one priority and the metric they are judged on. Leaders are shifting resources to direct solicitation in major, planned and annual giving. Productivity and efficiency are a big focus. New digital channels like crowdfunding, giving days, and targeted digital advertising are getting greater funding over the next few years. Download Advancement Leaders Speak to see the full results.